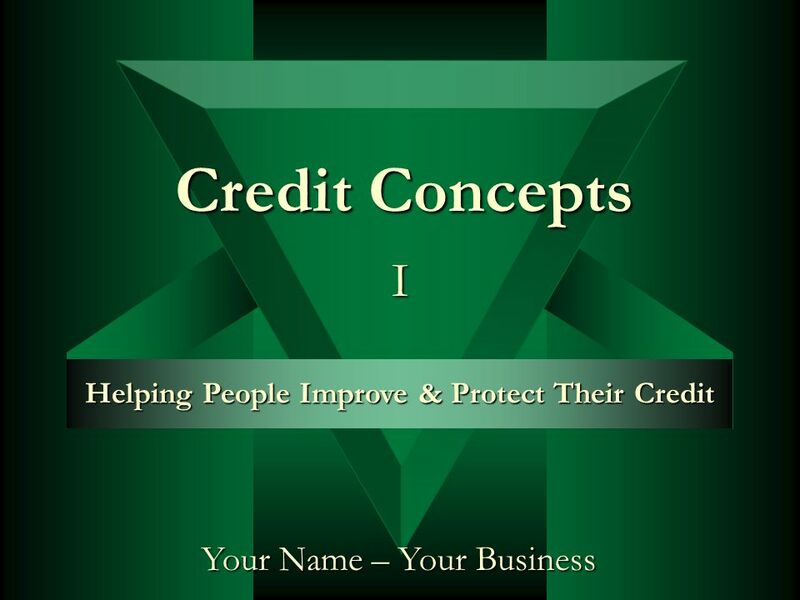 Your Name – Your Business Helping People Improve & Protect Their Credit Credit Concepts I. 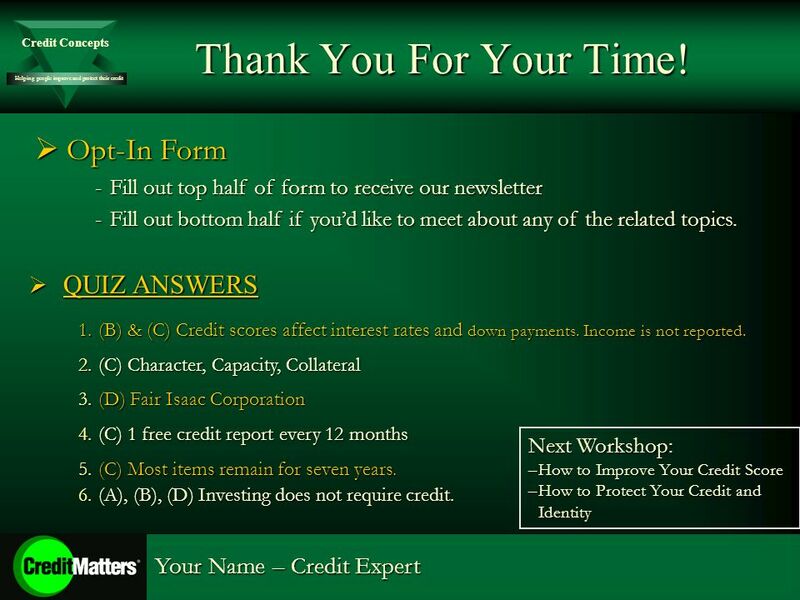 3 Helping people improve and protect their credit Credit Concepts Your Name – Credit Expert Credit Concepts Quiz 1. 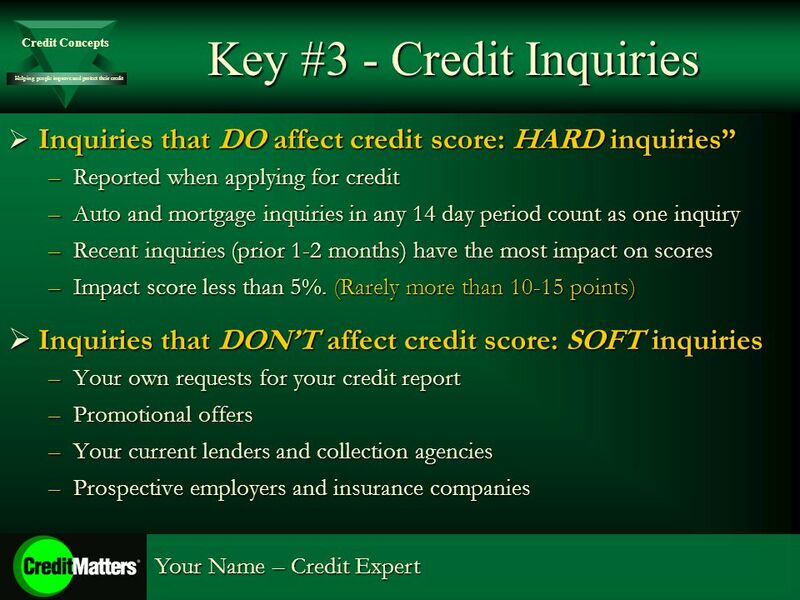 What do lenders such as mortgage brokers and other creditors use your credit report and score for? 2. 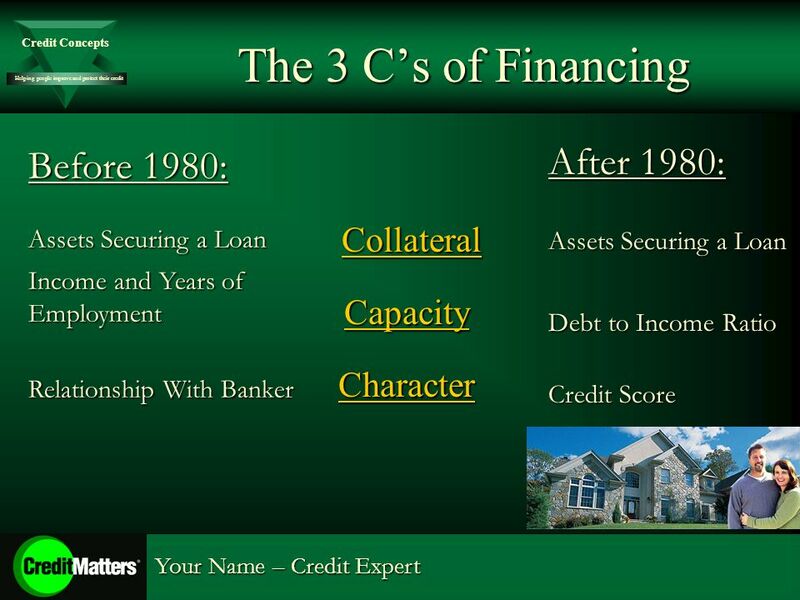 What are the three C s that a creditor considers when determining your approval for a loan? 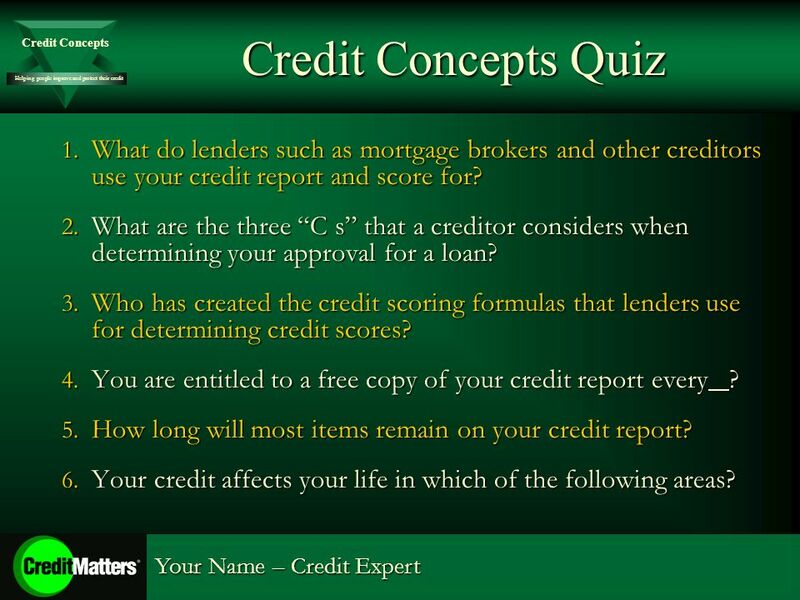 3. Who has created the credit scoring formulas that lenders use for determining credit scores? 4. You are entitled to a free copy of your credit report every ? 5. How long will most items remain on your credit report? 6. Your credit affects your life in which of the following areas? 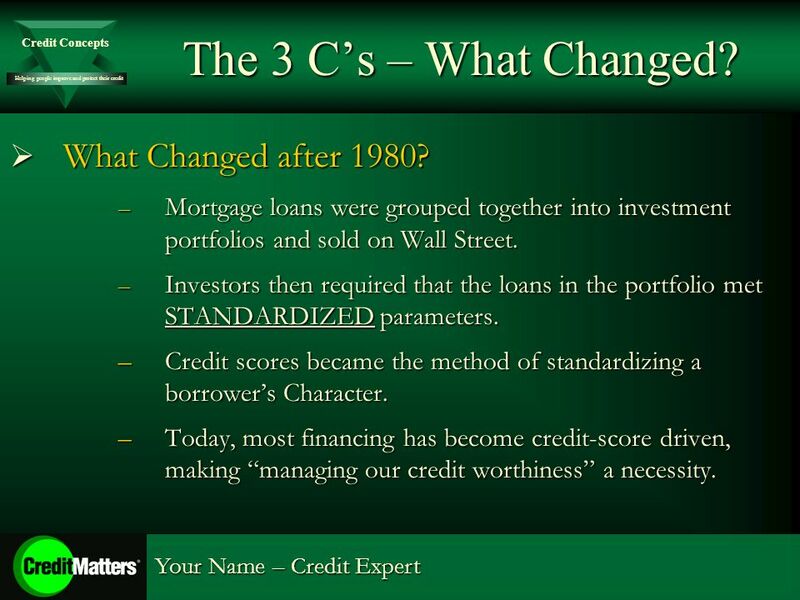 5 Helping people improve and protect their credit Credit Concepts Your Name – Credit Expert The 3 Cs – What Changed? What Changed after 1980? What Changed after 1980? – Mortgage loans were grouped together into investment portfolios and sold on Wall Street. – Investors then required that the loans in the portfolio met STANDARDIZEDparameters. – Investors then required that the loans in the portfolio met STANDARDIZED parameters. –Credit scores became the method of standardizing a borrowers Character. –Today, most financing has become credit-score driven, making managing our credit worthiness a necessity. 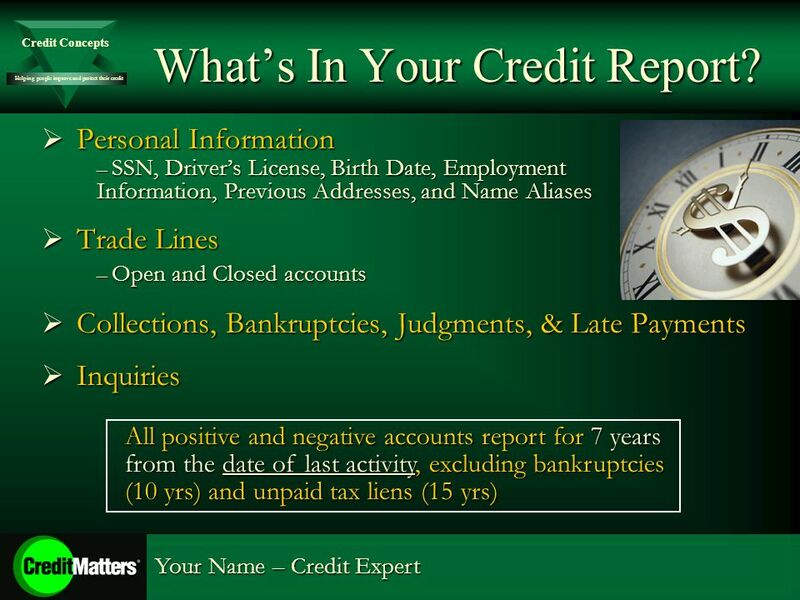 7 Helping people improve and protect their credit Credit Concepts Your Name – Credit Expert The Role of the Credit Bureaus TransUnion, Equifax, & Experian TransUnion, Equifax, & Experian –Profit-making companies –Gather data about consumers from creditors and public records depts. –Sell consumer data to the financial industry in the form of credit reports. Their Affiliation with the Financial Industry Their Affiliation with the Financial Industry –The credit bureaus customers are financial institutions (banks, creditors). –Financial Institutions want to avoid lending to bad credit risks. –Credit bureaus protect financial institutions by reporting ANY potentially negative credit data about consumers – often resulting in credit reporting errors. What Does This Mean? What Does This Mean? 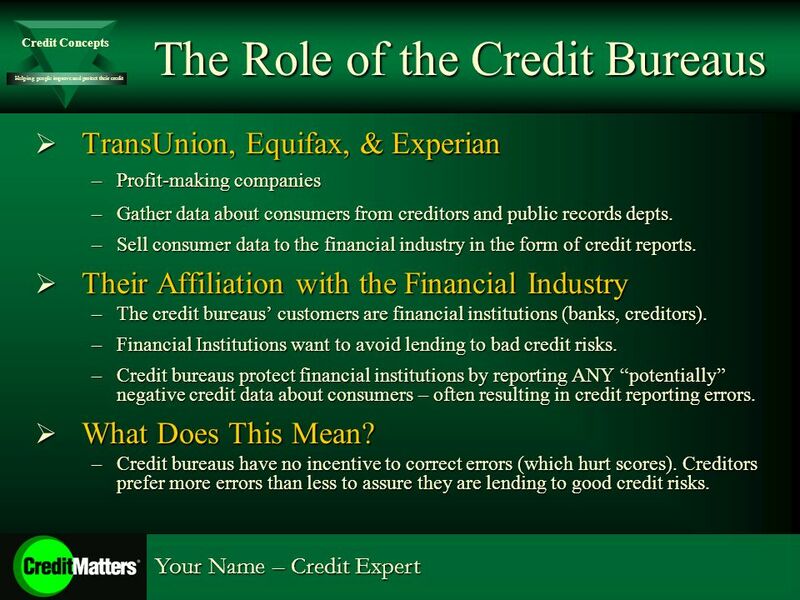 –Credit bureaus have no incentive to correct errors (which hurt scores). 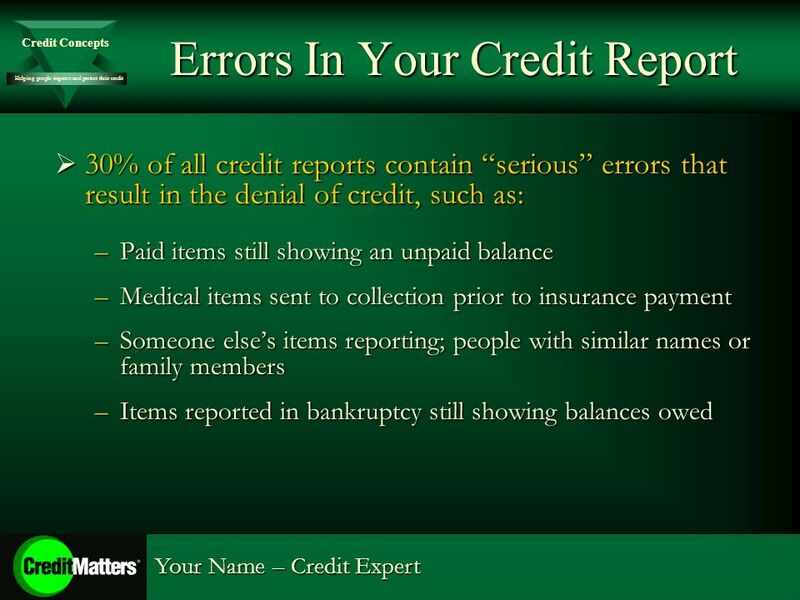 Creditors prefer more errors than less to assure they are lending to good credit risks. 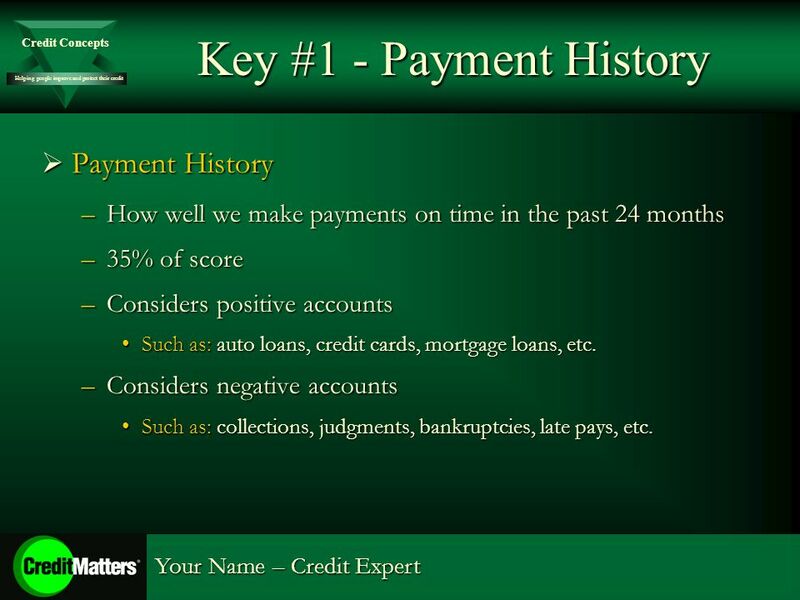 12 Helping people improve and protect their credit Credit Concepts Your Name – Credit Expert Key #1 - Payment History Payment History Payment History –How well we make payments on time in the past 24 months –35% of score –Considers positive accounts Such as: auto loans, credit cards, mortgage loans, etc.Such as: auto loans, credit cards, mortgage loans, etc. –Considers negative accounts Such as: collections, judgments, bankruptcies, late pays, etc.Such as: collections, judgments, bankruptcies, late pays, etc. 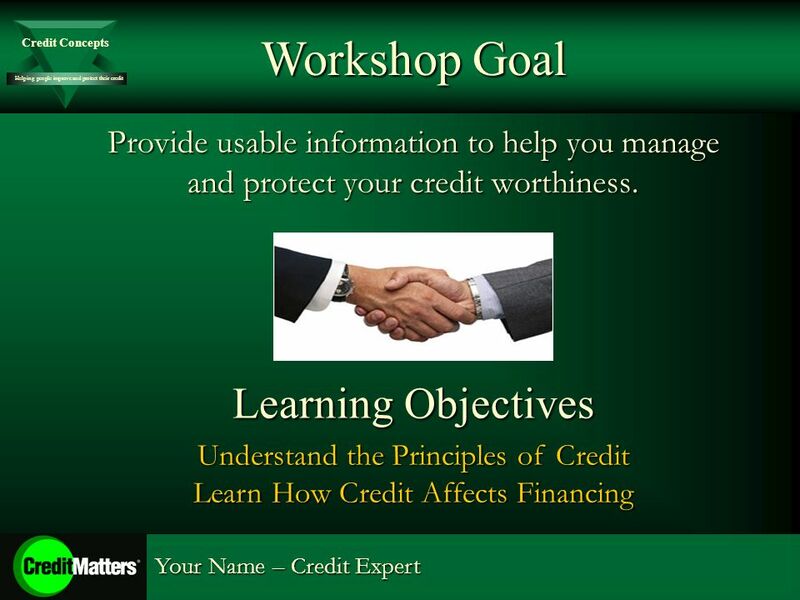 Download ppt "Your Name – Your Business Helping People Improve & Protect Their Credit Credit Concepts I." What You Need Before You Go to the Bank October 19-20, 2006 Jeff Walker Earl Stanfield. 1 FICO Scoring Cracking the Secret Code. 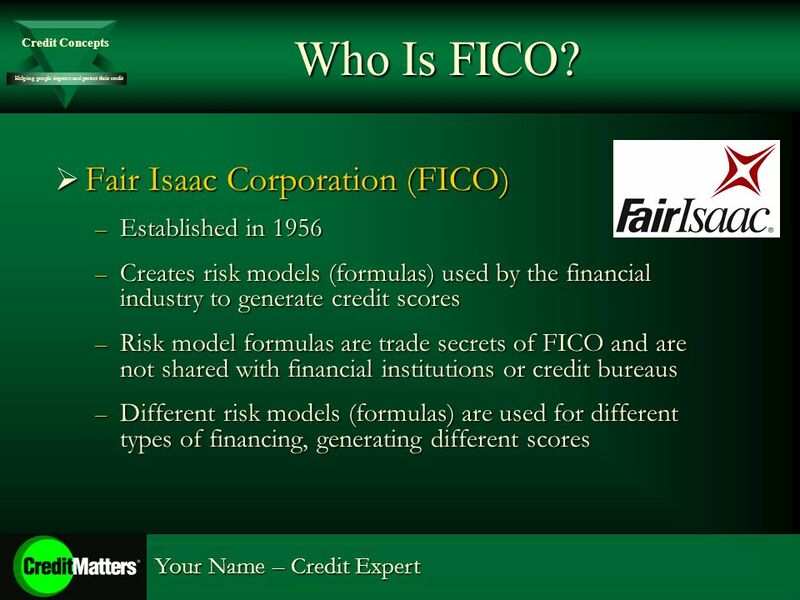 2 Objectives State the reasons for the development of FICO scores. Describe how credit reports are created. List. Your Credit Report Understanding the puzzle. March 29, 2011 Dale Ball, eni. 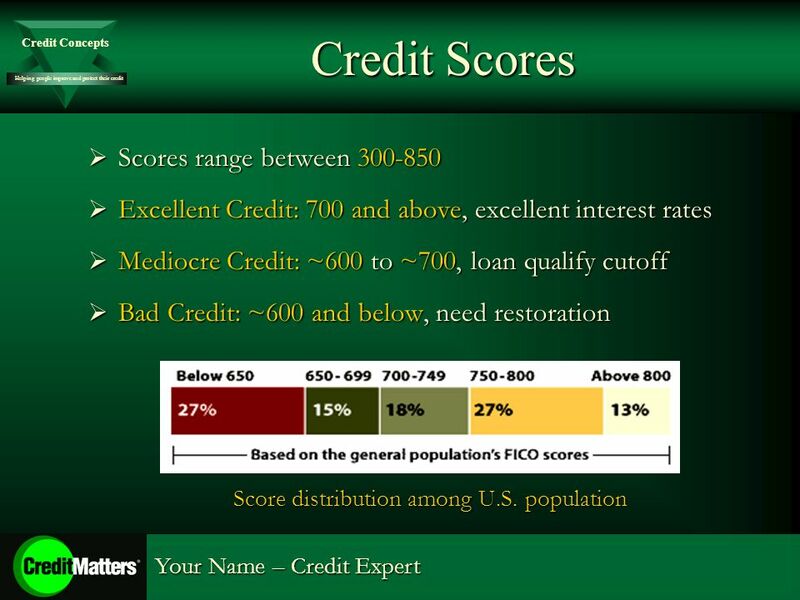 Understanding how credit scores are determined. Understanding how consumers actions impact their credit scores. Lesson 9 Fixing Your Credit. 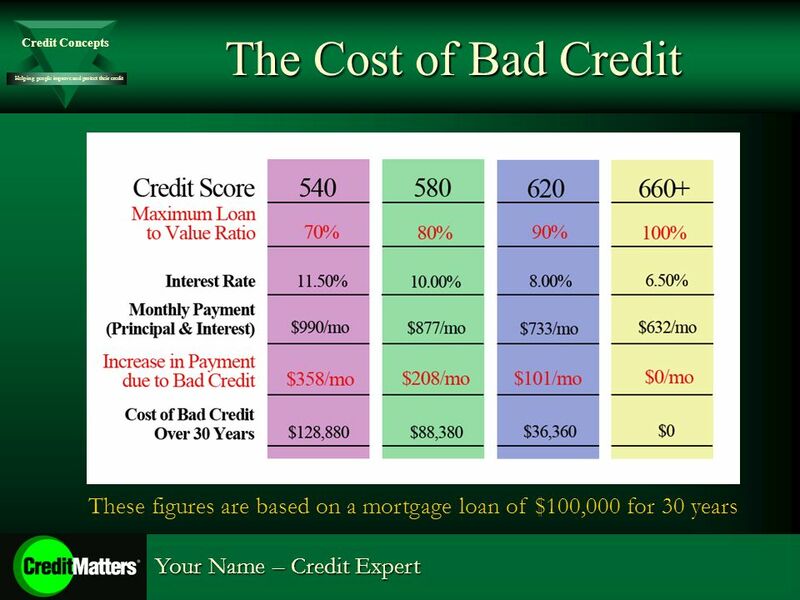 Credit Overview Brainwasheducationonline.com. 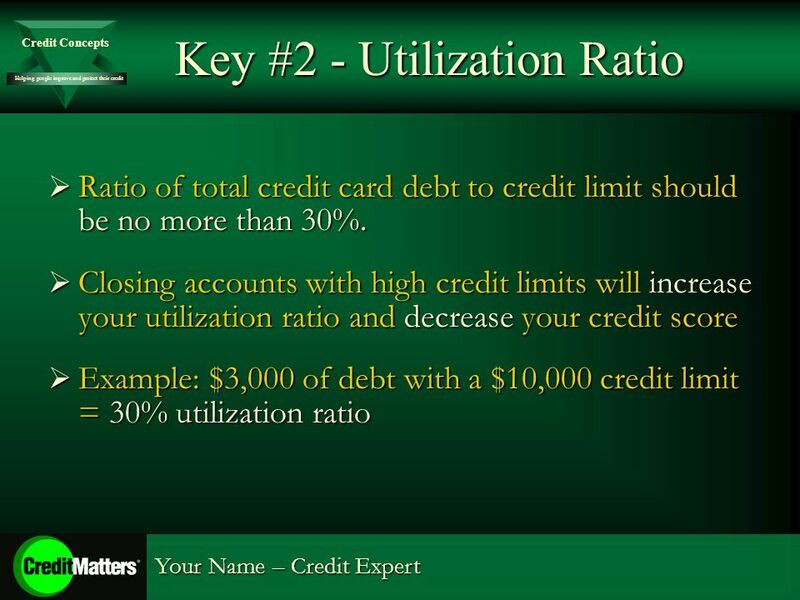 CREDIT CONTROLS OUR LIVES Limits or expands our financial stability Increases or decreases our quality of. Scams APR & Finance Charges Three Cs Credit ReportLoans. By Your Name Your Company Name Date Your Credit Score. 1 CREDIT THE TRUE STORY SMART MONEY. 2 What is Credit? An arrangement to receive cash, goods, or services now, and pay for them in the future. A claim. Presented by: Thomas Murphy Harvard University Employees Credit Union Medical School Loan Repayment & Building Credit PARTNERS OFFICE of RESOURCES for. GOOD CREDIT IS THE TICKET DO YOU KNOW HOW TO ACHIEVE IT? PART 2: MANAGING YOUR MONEY Chapter 6 Using Credit Cards: The Role of Open Credit. 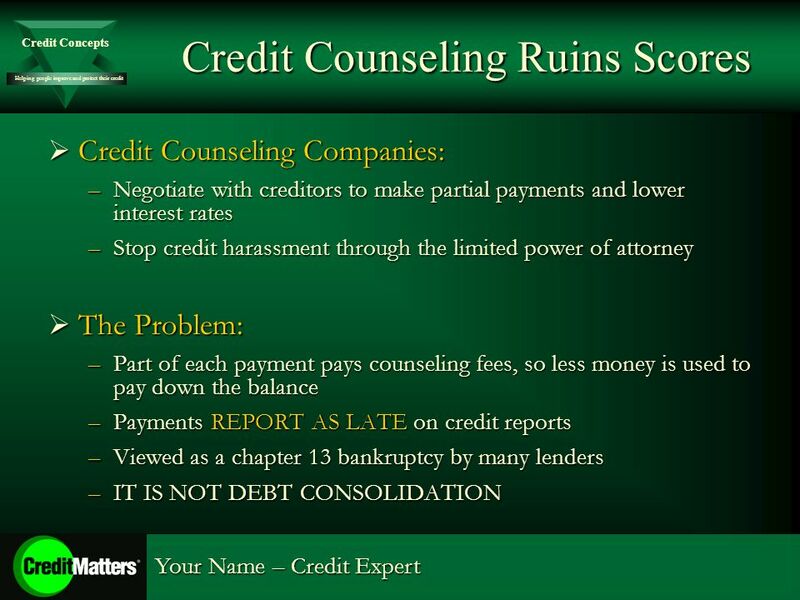 Credit Scoring and Scorecard Lending LESE 306 Fall 2008.